The hottest day of the year so far. 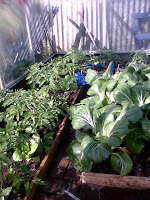 The allotment is growing well and cropping nicely. The garden is still growing spare car parts...but fewer than before, lol! The Carpenter has been made redundant-despite being able to work with wood and signwrite. If anyone will find work it is likely to be him. 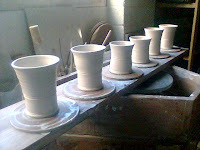 I'm off to make more pots, then to garden. One to make money the other to spend less and get something better. It is still dry here. I am hoping for the right sort of rain! Flash flooding, thunder and lightning and power cuts. We need nice gentle wetting rain-at night, of course!! Full greenhouse- it is too small already!! A 'funny peculiar' day. Bits of this and that got done, a day when you are busy and feel you have achieved nothing-until you list what you have actually done!! At least I started throwing pots again, this time in porcelain. 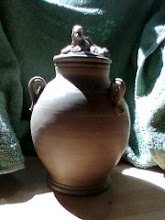 I am thinking how to organize my time to get enough done in the next month before the salt kiln firing. Possibly work in the early mornings-that way I should get few interruptions and I will be busy with pots when Mountain Man is busy with his stock, and we wont lose any of our time together! The weather really has turned! We had damp air then a nice fine wet rain from yesterday lunchtime. Last night at 7.45 pm there was an earthquake near Maesteg (3 on the Richter scale). Now we have a thunderstorm and torrential rain, after a morning of steady rainshowers. So today has been a baking day so far, bread and birthday cake-chocolate of course! I left half a pint of milk out ready to make scones, as it was a little too ripe for coffee. I forgot it....and the next day, curd cheese!!!! 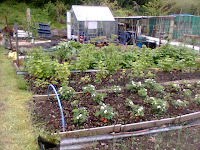 Mountain Man's allotments are looking better now! He is catching up on the growing after all the lambing. I am mainly clearing paths and unused patches and untidy bits! His garden has never looked so good! lol!! There is hope of rain in the next 24 hours. That would bring everything on fine. I decanted the last of the comfrey liquid manure-a goodly stench!! 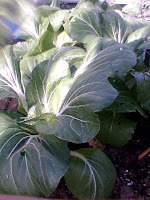 It is slightly reminiscent of mature chicken manure. Perhaps that is the smell of nitrogen?! The Oily One has gone out on his bike, at long last-hope he doesn't overdo it. I'll be back to the gardens again thus evening to work in cooler air until the midges arrive. Gardening is done early and late, or in the shade! Today's bread is on a 'go-slow'. I didn't think that would happen in this weather! !